My fellow Bite Clubbers, I cannot believe I am writing to you on the very cusp of December, and thus, the holiday season. I just checked the date of my last post (September?!) and gasped. Time flies when you're busy, and I've been busy in spades! It's not a wonder I haven't sat down with you guys for a chat or a bite to eat! Honestly, if Rebekah hadn't been so generously sharing her meals with me over the past 2 months, I would be A) emaciated or B) living on cold cuts, cheese, almonds and coffee. But-- I digress. With Christmas coming and my classes almost finished, I can see the never ending landscape of essays, presentations, and articles disappearing, and on the horizon, there's something amazing waiting: holiday baking! 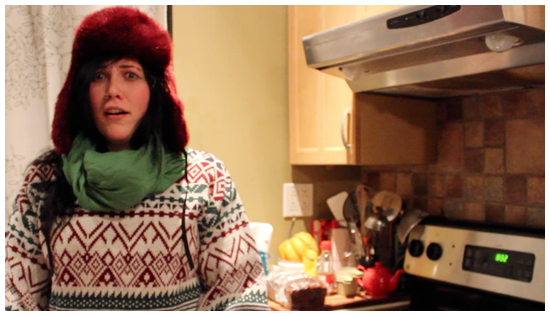 Christmas is the one time I can justify going completely off-the-wall-and-deck-the-halls insane. There are always neighbours and family to share the love (and the cookies) with. In fact, I've already started my descent into seasonal bakemania. In short, I'm writing an academic research paper worth 50% of my grade on why fruitcake is so unpopular. I'm going to use it as a weird party story, or throw people off with it in games of "two truths and a lie." People usually cringe at the very mention of fruitcake, but it used to be the cake of kings, literally. Queen Victoria's wedding cake was a dense, one layer plum confection. Even recently, The Duke and Duchess of Cambridge, aka Kate Middleton and Prince William, served an eight tier frosted fruit cake as their wedding cake! Still, to the general public, it remains a joke and a pariah. Even I realized I have bias against fruitcake although I had never even tried it! How ridiculous is that? When have I ever turned my back on cake without giving it a chance first? There was only one thing to do and that was to tame the beast for myself and then EAT IT. So here we are. This beauty is currently sitting on my counter, marinating in brandy, waiting to be brought home to a family who will (hopefully) enjoy it along with me! If you hate raisins (looking at you-- the ENTIRE WORLD) substitute it for more of another kind of fruit! That's right, no excuses, you have to try this. 1. 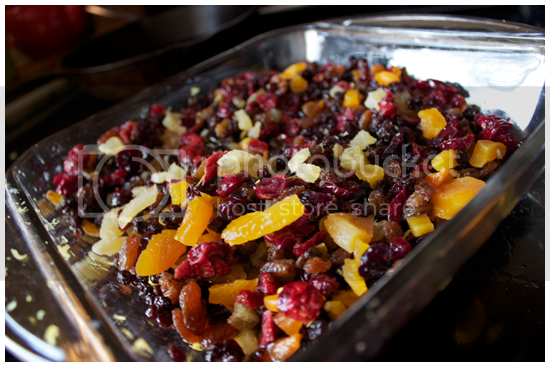 Combine raisins, currants, cranberries, blueberries, cherries, apricots, zest, ginger and brandy in a glass bowl. Stir to combine, and let soak for 1-5 days, stirring once each day. 2. Put the fruit in a large saucepan with the sugar, butter, water and spices. 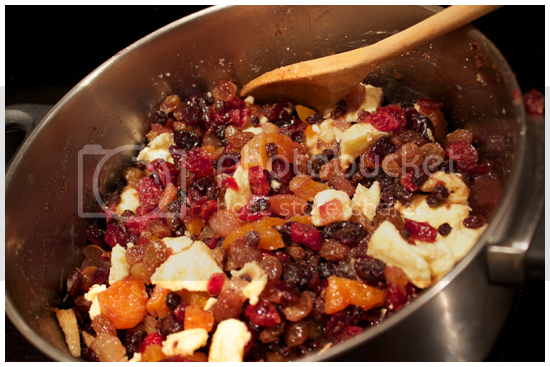 Bring to a simmer over medium heat, stirring frequently for 5-10 minutes until the mixture is thick and syrupy. Remove from heat, let stand for a minimum of 15 minutes. 3. Preheat your oven to 325 degrees. 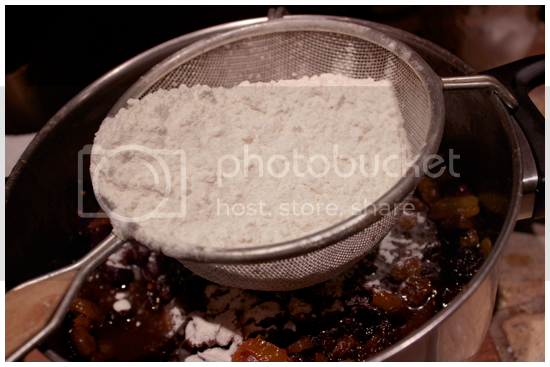 In a separate bowl, sift together flour, salt, baking soda and powder. When the fruit mixture has adequately cooled, dump this dry mixture in all at once and quickly beat it together with a wooden spoon. 4. Beat in the eggs one at a time, and then fold in the pecans. 5. Move the batter into a 10-inch loaf pan, either nonstick or grease generously with butter, smoothing the surface to make it tidy. 6. Bake for one hour, then check the middle of the cake for done-ness with a butter knife. If it is not finished, add time in 5-10 minute intervals until it is done. 7. Baste the top with brandy, then allow the cake to cool in the loaf pan before running a knife thoroughly around the edge to set it loose. 8. 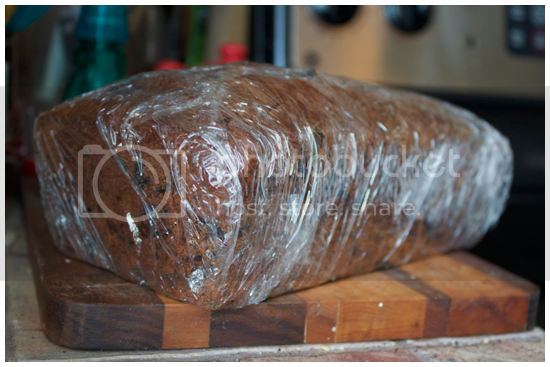 Wrap the cake in airtight plastic wrap, and unwrap every two days or so to baste with more brandy. You want to keep this up for at least two weeks for optimum flavour, but fruitcakes can be aged for a month or even longer! 1. Combine dried fruit, zest and brandy in a bowl. Cover in plastic wrap and soak overnight, or for up to 5 days. 2. When you are ready to bake the actual cake, put the fruit, sugar, butter, water, and spices in a large saucepan over medium heat. 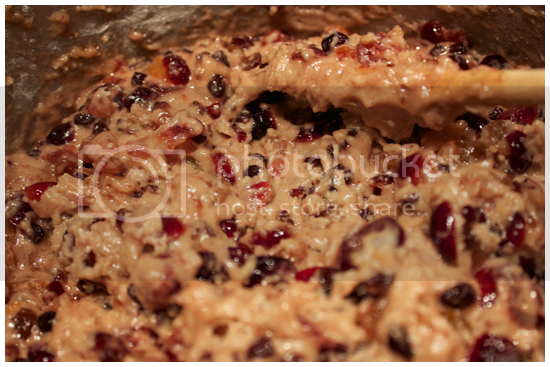 Simmer for 5-10 minutes, stirring frequently until it is melted together, cohesive and syrupy. Remove from heat and let cool for a least 15 minutes. 3. In the meanwhile, sift together the flour, baking soda and baking powder, and salt. Whisk. 4. Preheat the oven to 325 degrees. When the fruit mixture is cool enough, add the flour mixture to the fruit mixture, beating quickly with a wooden spoon to combine. 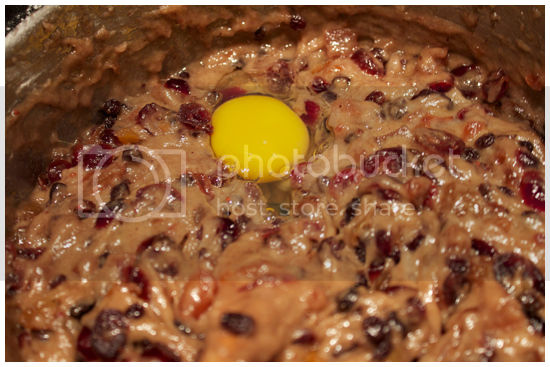 Add the eggs one by one, beating until fully incorporated. The batter will be glossy, thick and very heavy. 5. Transfer the batter into a 10 inch loaf pan, and bake for 1 hour. Check the center with a knife and add 5-10 minutes if it is not finished, consequently, until it is finished baking. 6. Baste the top of the cake with brandy after it has been taken under the oven. Allow the cake to cool in the pan completely before cutting it loose. Wrap the cake tightly in plastic wrap, or put it in an airtight container. Every two days, baste or spritz the cake with brandy. "Season" the cake for at least two weeks, but you can keep this practice up for a month. Slice and serve! Although I technically haven't TRIED this cake yet, I don't think Alton Brown would lead us astray. 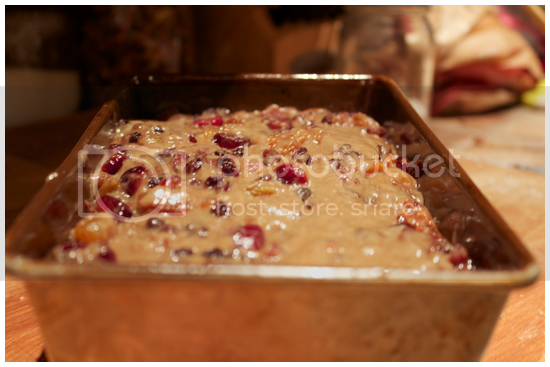 This is definitely not the last post you'll see on the subject of the notorious fruitcake. Perhaps a taste test is on the way? Welcome back, Bite Clubbers, and welcome home!